I had the opportunity to talk with Del Smith of Normandale Community College in Bloomington, Minnesota last fall at the American Vacuum Society Symposium in Nashville, Tennessee. Del has put together a phenomenal set of accredited classes specifically to teach vacuum technology and thin film technology with the purpose of graduating qualified technicians. In this video, Del presents the concept of vacuum technology to laypeople and discussed the importance of training qualified technicians. He points out that unlike mechanical, electrical or medical technicians, vacuum technicians are a relatively small group of individuals but are in high demand. It is well worth watching this video as Del explains the importance that industry is placing on having trained individuals who understand in detail vacuum technology beyond just being able operate the equipment from recipes without understanding. I admire Del for the well thought out program and equipment he put together and his desire to to give back to the vacuum industry. I was chewing on a problem with some tungsten cathodes in a pressure gauge. I knew that guys like Irving Langmuir had probably solved that problem a long time ago. After all, we have been putting incandescent tungsten in vacuum systems for more than a century. That started me on a search for old books. Langmuir (center) in 1922 in his lab at GE, showing radio pioneer Guglielmo Marconi (right) a new 20 kW triode tube. Wikipedia.org. Langmuir worked at General Electric from 1909–1950, where he advanced several basic fields of physics and chemistry, invented the gas-filled incandescent lamp, the hydrogen welding technique, and was awarded the 1932 Nobel Prize in Chemistry for his work in surface chemistry. My search took me to an unassuming, yet interesting place; www.tubebooks.org. This is a vast collection of out of print materials that have been scanned into PDF format. 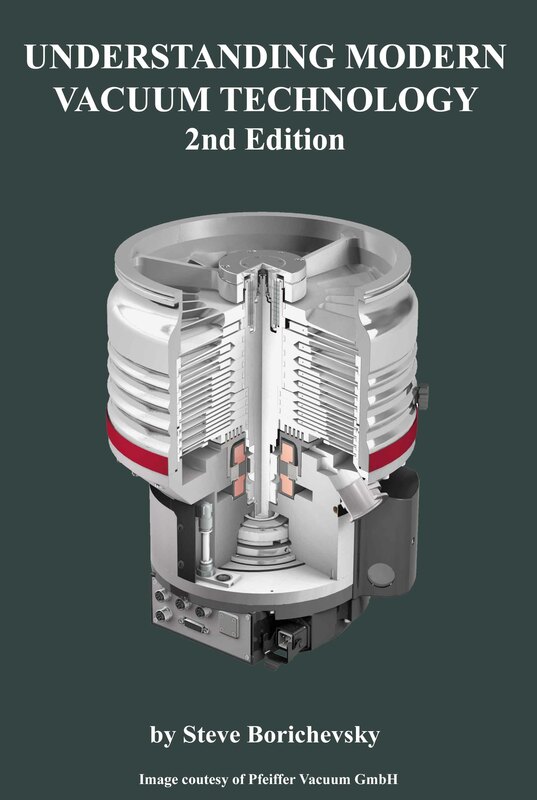 I did find some juicy books for vacuum tube technology and got some great insights into the problems of the day. This video published by Pfeiffer Vacuum shows how gas flows from the inlet of a blower to the multi-stage roots pump and out the exhaust. These pumps can be robust enough to handle harsh processes. Like all harsh duty pumps, there is a nitrogen blow-by on the bearings to prevent process by-products from destroying them. Depending on the manufacturer, gas purges may be introduced into the various stages of the pump to help move corrosive material through. Manufactures will also run the pumps at elevated temperatures. Pfeiffer Vacuum (Asslar, Germany) purchased the Adixen (Anecy, France) on 31 December 2010. This filled a gap that existed in Pfeiffer’s roughing pump portfolio. It also opened up markets for both companies. Other companies that make multi-stage roots pumps are Edwards Vacuum, Kashiyama and Ebara. You can learn more about roughing pumps in Understanding Modern Vacuum Technology. Preparations for the program of AVS 65 International Symposium and Exhibition are well underway. The deadline for the submission of was the 1 May, 2017. That means that those of us who are on the Program Committee of the Vacuum Technology Division are reading through the abstracts and putting together the program. I have just been through the 57 abstracts for the VTD program and I am impressed. We will be getting briefed on some cutting edge technologies. There is a new paradigm in pressure technology discussed. NIST is moving over from mercury manometers to photonic based pressure standards. Tri Alpha Energy will be giving a talk on the progress of their latest fusion reactor. They have some very stringent vacuum requirements and are using chemisorption surfaces to pump H2 along with cryogenic surfaces. There will be several discussions about vacuum generation in high energy physics experiments in Japan, the UK, Germany and the US. Paul Arnold of MKS/Granville-Phillips will give an invited talk as part of the AVS History Committee endeavor to preserve our technical heritage. He will discuss the Electro-Ion pump developed in the 1960s. This was a complex UHV pump that combined cutting edge technologies in one package; a titanium sublimation pump with a triode pump. There will be discussion about handling EUV exposure systems, vacuum systems to improve storage batteries, process development for new lighting technologies and much, much more.